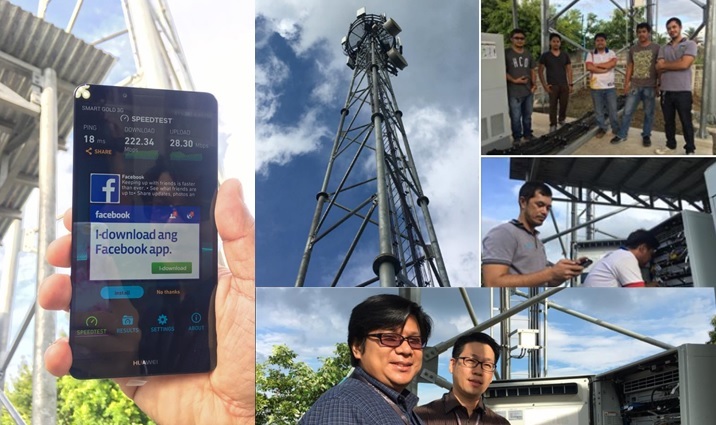 MANILA, Philippines - (Updated June 11 at 11:00 a.m.) Wirelesss services providers Smart Communications Inc. (Smart) and Globe Telecom have successfully fired up its first cell sites using 700 MHz frequency for Long Term Evolution (LTE) technology on Monday, June 6. The on-airing of LTE sites using new spectrum came in just a week after the acquisition of the telecommunications business of San Miguel Corporation (SMC) which includes the 700 MHz band with an aim to deliver faster, more reliable and affordable Internet services throughout the country. The low-band 700 MHz has a longer range and provides better indoor coverage than high band frequencies. LTE is the fourth-generation (4G) mobile phone technology that currently provides the fastest wireless data service commercially available. In a report by Globe, the internet speeds of conducted tests by the National Telecommunications Commission (NTC) reach 66 Megabits per second (Mbps) to 100 Mbps (using Ookla's Speedtest application) near the site at Bougainvillea in UP Diliman, Quezon City. 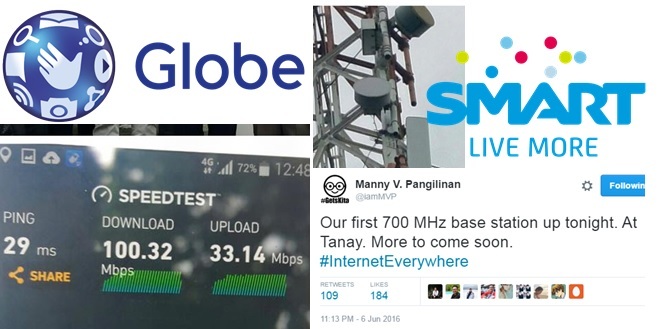 Globe speed tests registered 100 Mbps using newly acquired 700 MHz frequency from San Miguel Corp.
"If you are downloading a 100-megabyte na video clip, it will take you practically just a second with these kinds of capabilities right now," said Manny Estrada, Globe's senior vice-president for tech service design told ABS-CBN News. Smart, however, through PLDT Group Chairman Manny V. Pangilinan announced that its 700 MHz-powered base station was on-aired late Monday in Tanay, Rizal. The PLDT subsidiary introduced carrier aggregation in the Philippines when it fired up the country’s first LTE-A service, also referred to as 4.5G, in the resort island of Boracay in April this year. On Tuesday, two more cell sites were fired up at Ecoland in Davao City and Manggahan, Pasig. In both sites, around 100 Mbps speeds were recorded. Our 2nd 700 MHz cell site up already! In Davao City at Ecoland, Matina. Download speed 101 Mbps. More to come. 3rd 700 MHz fired up and on air. Manggahan Pasig LTE 700 DL speed: 101.31 Mbps. Go Smart! Reports said that Globe will roll out initially about 200 sites using the 700 MHz frequency in the National Capital Region (NCR). For Smart, spokesperson Ramon Isberto said the company is planning to activate 360 700 MHz LTE base station in Metro Manila, Cebu, and Davao this year. Aside from deploying LTE on 700 MHz, the availability of devices that support this frequency is a must to experience the high speed rate it can offer. Potential bands on 700 MHz can be on Band 12 or 28. As of the moment, NTC has no assignment yet of what band to use in the country. Devices that compatible with the Band 12 or 28 include Huawei P9, P9 Plus, LG G5, and the Galaxy S7, S7 Edge. This also includes other Samsung models Tab S2, Galaxy Note 5, S6, S6 edge, J5 2016, J7 2016, A5 2016, A7 2016, and Tab A 2016, O+ models Sonic and Xfinite and Huawei devices GR3, GR5, GR8. Local manufacturer MyPhone is introducing nine handset models and a pocket WiFi that will run on 700 MHz by September this year. According to Globe Senior Vice President Joel Agustin, iPhone users will be able to access the 700 MHz frequency upon release of iOS 10 update sometime this year. Joachim Horn, PLDT and Smart chief technology and information advisor said they are holding discussions with device manufacturers so that more affordable LTE smartphones and tablets using 700 MHz will soon be available in the country.